Core aeration is the process of mechanically removing small plugs of thatch and soil from the lawn to improve natural soil aeration. 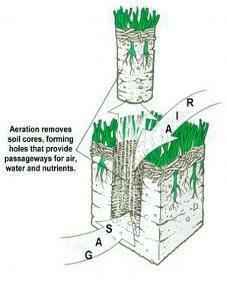 The benefits of aerating your lawn include improved air exchange between the soil and atmosphere, improved fertilizer uptake, stronger turfgrass roots, enhanced heat and drought stress tolerance, and enhanced thatch breakdown. 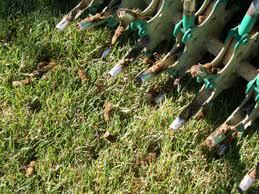 Lawn Aeration promotes a healthy lawn and helps to eliminate weeds.